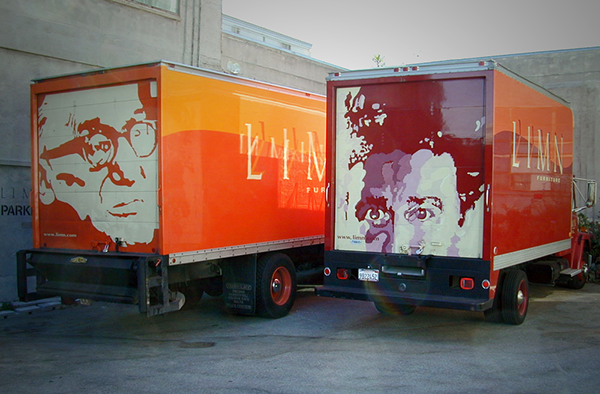 The Limn delivery trucks needed to be iconic for an eclectic San Francisco crowd. Who better to adorn them than Le Corbusier and Philippe Starck? What good is one store when you can have two? For the opening of our Sacramento sister store Dan asked me to create a series of billboards that would be a little on the quirky side. We had this little stuffed animal floating around the office and I thought what a great mascot it would make, and as you can see it was filled with tons of personality. Limn was located in the heart of San Francisco's digital alley, and we in the middle the .com crash. Dan wanted some billboards that were like a punch in the face. Ultimately these were a little too punchy. Personally I like to think they were ahead of their time. One of my favorite assignments was creating arwork for the Limn Gallery space. This show was titled "Distortion & Desire" and it became just that for me. Eager to work outide of the digital realm, I created paper negatives of type and brought them into the dark room allowing me to distort and warp the type with an enlarger, and then processing the images as though they were film.